2020 J.K. Mullen (Colo.) defensive tackle Aidan Keanaaina‍ holds the nickname ‘The Big Kahuna’ and apparently the four-star prospect is only getting bigger this offseason. Keanaaina says he is weighing in at around 295 pounds but will likely lose some weight over the next few months to prepare for his senior season. When it comes to his game, the 6-foot-3, 295-pounder was seen shooting gaps more frequently as a junior and the aggressive play was a point of emphasis over the last year. “It’s something I wanted to incorporate because I learned a lot between my sophomore and junior year,” explained Keanaaina. “I watched a lot of my sophomore film and coaches pointed out stuff for me to look at. I started to focus on the gap and not the man. I wanted to attack the gap and not the man straight up because that takes longer. The Colorado native made a conscious effort to listen to his coach and college coaches across the country by improving different aspects in his game. “My coach says stuff like that because he’s always coaching me,” he said. “I really didn’t get it pointed out until coaches at colleges explained it to me. I always asked what I needed to work on going into my junior year and I got similar answers every time. 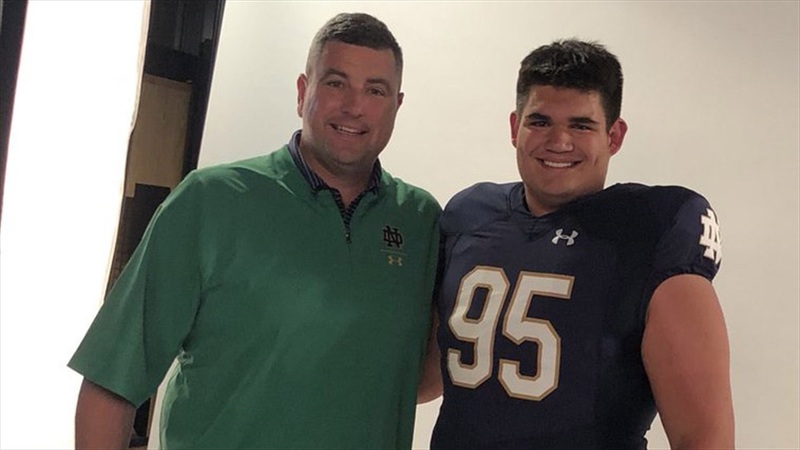 The tips were much appreciated by Keanaaina, but the growth on film was appreciated by coaches like Mike Elston (Notre Dame) and Larry Johnson (Ohio State) as the J.K. Mullen star showed he could take coaching. When it comes to his recruitment, Keanaaina has decided to commit sooner than later. And by soon, we’re talking next week on February 13th, which is also his birthday. Keanaaina will only take one official visit and that will be to be the school he commits to in a week. “A lot of people have asked why I’m only taking one official,” explained Keanaaina. “My answer is if I’m basing my decision off of an official visit, then that’s really not what the school is to me. When you go to a college, it’s not all about the praise and everything you get on the official visit. The timeline might seem early for a prospect who holds offers from Arizona State, Cal, Colorado, Colorado State, Florida, Michigan, Nebraska, Notre Dame, Ohio State, Oregon, Penn State, UCLA, USC, Wisconsin and Yale, but Keanaaina is at peace with his decision. “It makes me comfortable because I have a rough idea what I like from the schools I’m going to choose from,” Keanaaina said. “I’ve always said I could commit now or next year, but I really want to be committed to a school I enjoy and embrace the school until I go there.